Your feet form the foundation of the body. It is from these 52 bones, 66 joints, 214 ligaments and 38 muscles that we are able to propel ourselves through our daily lives. Furthermore, the average person takes 8,000 to 10,000 steps per day. It is no wonder that when the foot begins to hurt, we take notice and want it resolved quickly. The foot offers the body two very important functions. The first is stability. It provides a solid base of support (keeps us up against gravity) and a rigid lever for moving the body forward. The second function is mobility. This allows for shock absorption, maximum contact with the ground for uneven terrain and allows unusual forces in the hips and knees to be absorbed. The anatomy of a normal foot allows for both to occur at the same time. The term that most people attribute to overpronation is “flat feet.” Pronation is the rolling in of the foot and the collapse of the arch. Every person pronates to some extent and this is a necessary movement in the normal walking cycle as it allows the forefoot to make complete contact with the ground. Overpronation is when a person pronates too much and for too long. This places excess stress on the tendons and ligaments in the foot and ankle. A foot that overpronates acts like a loose bag of bones during the walking cycle. This makes this type of foot very flexible but inefficient. The foot has to work much harder to propel the body, fatiguing easily and placing mechanical stresses on the lower body; we like to use the analogy of digging a hole in the dirt. Overpronating feet are like using a broom to dig the hole. It won’t break down quickly, but you will be digging for a very long time, or until eventual wear and tear will take effect. Wouldn’t you rather have a shovel to work with? So it’s essential for our overall health and wellbeing that we make a conscious effort to focus on exercising our feet. Below are some really simple exercises to keep your feet beautiful that can take place anywhere! Place a tennis or golf ball on the floor in front of you. It should be about a foot out from the front of the chair, and you should be able to reach it easily with your foot. Place one foot on the ball. 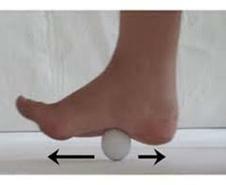 Start with the ball on the arch of the foot and gently roll the foot forward, massaging the foot from arch to heel. Reverse the motion and roll the foot backward on the ball,massaging the arch to the toes. Put more pressure through your leg for a harder massage of the foot, less pressure if the massage is too intense. Repeat this motion for about 15 minutes on each foot. This exercise is very similar to the Monster Footwork. The foot mechanics are the same but the goal has changed. Instead of using the intrinsic muscles of the foot to propel your foot forward, you will use the intrinsic muscles of the foot to pull a towel underneath the foot. What to watch for- If your foot is not used to this movement the bottom of your feet may cramp. If this happens simply shake the foot out until the cramp releases and start again. As your foot gains dexterity the cramping will happen less and less. This exercise may try your patience a little bit. Remember to keep breathing and embrace the learning process. The more tension in your body and posture the harder it will be to complete the exercise. This exercise is also a foot dexterity exercise. It is very similar to the previous exercise but much more difficult to coordinate. This makes it a great exercise because it challenges neural pathways from your brain to your foot. To do this exercise you will sit in a chair with both feet planted on the ground. Your heels will be directly beneath your knees and the rest of your foot will shoot out directly in front of your heel. To start the exercise lift your toes while keeping the ball of the foot in contact with the floor and then place each toe back on the ground individually starting from the big toe moving sequentially through the toes all the way back to the pinky. Repeat 10-12 times. 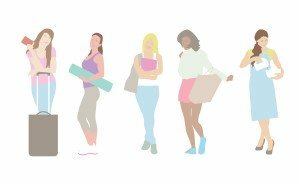 What to watch for– As with any of the seated exercise this can be a full body workout if awareness of the breath and upright posture are part of the exercise. Be sure to keep your gaze forward and sit on the edge of the chair. The hardest part of this sequence is going to be placing the second toe on the ground, but keep working the struggle is part of the learning process. This exercise is intended to move and warm the ankles. It is also a great exercise to practice foot ankle and knee alignment with movement. It can create a healthy movement pattern that will then translate to a healthy gait pattern. To do this exercise, begin standing with your weight equally distributed between your two feet. Then lift one heel and while imagining the other heel reaching to the ground. Then as you are lowering your first heel let the other heel begin lifting away from the ground. Continue alternating the movement in your ankles as you imagine that you are moving your ankles through a thick substance. Repeat for 30 seconds to 1 minute. Things to watch for- be sure to be aware of your posture. As your ankles are moving imagine a wave moving through your spine. It’s an easy wave that lubricates the joints at your knee and hip as well. As with all of these ankle exercises it is always important to be sure that your knee is tracking over your second and third toes.